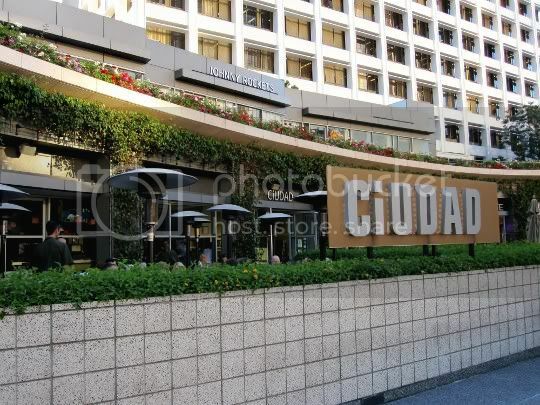 The perfect restaurant for the nouveau Downtown LA, Ciudad is trendy, artsy, Latin cuisine at its finest (and yes, the prices reflect that). There's a great energy abuzz here: the interior is open and airy, with light-colored walls, dim lighting, and art pieces hanging throughout. You almost feel as if you're dining in a fun, colorful art gallery. Maybe even better is the al fresco dining, enclosed in its own herb-surrounded patio, surrounded by tall buildings and the noises of the city. As far as the food is concerned, vegetarians will find a nice selection of menu options, with both seasonal and staple dishes. 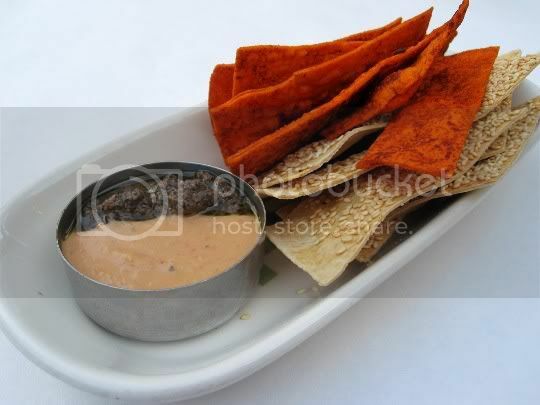 Don't expect the traditional Mexican chips and salsa as a starter...Ciudad is a pan-Latin restaurant. Instead, you'll get two kinds of flatbreads with hummus and olive dip. One flatbread is like a regular sesame cracker; the other is dusted with some sort of spice mixture. I could taste paprika and maybe some chili powder, but they both lacked the saltiness I would have expected. They are crunchy and delicate, but sturdy enough to stand up to the dips. The hummus does have some Mexican flavors to it, and the olive dip is tapenade-like, but without the overwhelming briny olive flavor (and I hate olives). An interesting way to start the meal...not quite as addictive as chips and salsa, but decent. 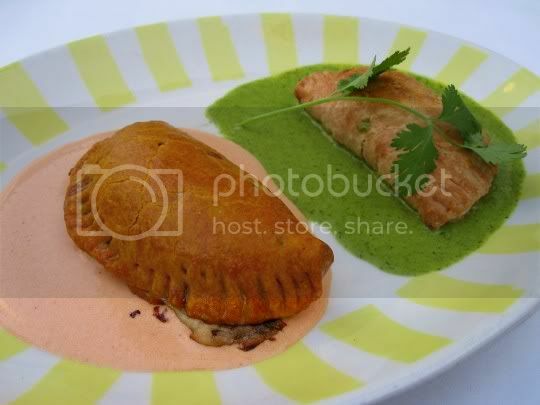 Two small empanadas with a lot of flavor and heartiness for their size. Seriously, you could probably make a light meal out of these, along with a side dish or salad. 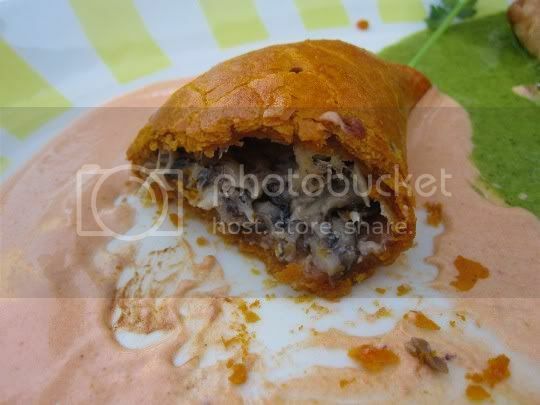 One is a wild mushroom empanada in a tomato-flavored crust served over a chipotle cream sauce. It's very rich, very earthy, and very cheesy, and a great pairing with the smoky chipotle flavor. 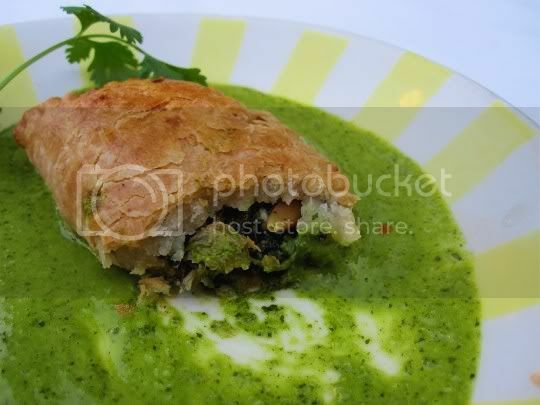 The second empanada is filled with spinach, pine nuts, manchego cheese, and raisins, and served over a tangy parsley-based salsa verde. The crust is doughy, yet delicate, and also very rich. It's salads like this that showcase the divinity of fruits and vegetables, and you can tell Ciudad uses fresh and top-quality ingredients just from this dish. 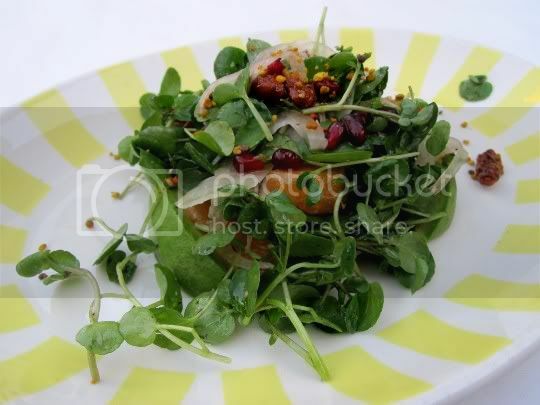 Bitter mache and other microgreens, juicy sweet satusuma segments, shaved fennel, delicious buttery avocado, and pomegranate arils are tossed in a light and just-barely-sweet citrus dressing. And to top that off, there are oh-so-sugary candied walnut pieces that just melt in your mouth and add a wonderful crunch. The salad has such a wide variety of flavor and texture elements, but best of all, it tastes so refreshing and wholesome. One interesting not of this salad was the light sprinkling of bee pollen: it doesn't have much of a flavor, but coats your tongue and is supposed to be very high in certain vitamins and minerals. So, why not? While I wouldn't say this colorful and aromatic dish is really worth the extremely steep price, it is a good, hearty vegetarian main entree that you probably can get two meals out of. A giant roasted poblano is stuffed with roasted potatoes and cotija cheese, set on a warm "salad" of red quinoa and fresh mint (I think it was mint). Cripsy tortilla strips are sprinkled on top, and the pepper is covered with a sweet marinara-like tomato sauce. 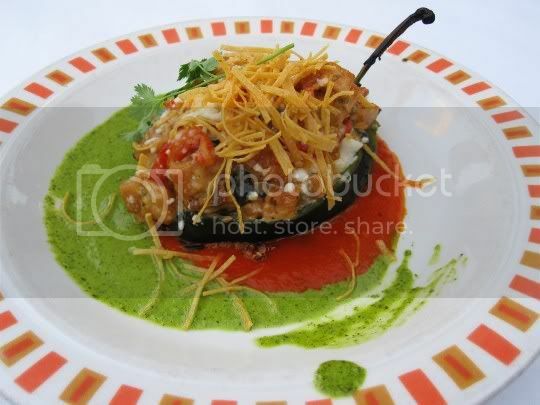 The parsley-based salsa verde surrounds the plate, and provides a wonderful tangy contrast to the bitter, roasted pepper flavor. Something about this dish is very rich, so go slowly. I was surprisingly disappointed in this dish, because I love, love, love tres leches cake. Served with two AMAZING fruit sauces not typically served with this cake--passionfruit and prickly pear--they're tangy, tropical, and not overly sweet, but oh-so-refreshing. There's also a mound of fresh whipped cream, which is creamy, light, and clean-tasting. But now we come to the cake. 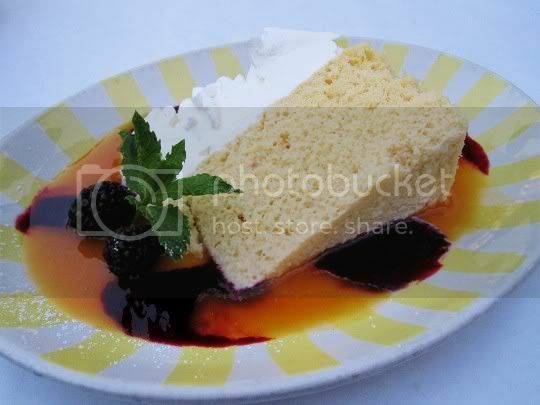 Tres leches cake is known for being soaked in "three milks," so the cake is a little wet, tender, and creamy. But this version has a strange texture: spongy, crumbly, and surprisingly dense. The cake doesn't melt in your mouth; rather, it falls apart in wet crumbs. The milk mixture is thin--too thin--and not very sweet...and that doesn't pair well with a cake that isn't too sweet either. Eat here again? Definitely. The fresh ingredients, seasonal variety of vegetarian menu options, and wide array of side dishes and desserts make this a fine-dining go to. Just bring your paycheck with you! OMG! I love Ciudad -- mostly for their drinks -- but the food is good too! :D Thanks for this look at some of their dishes from a vegetarian perspective.